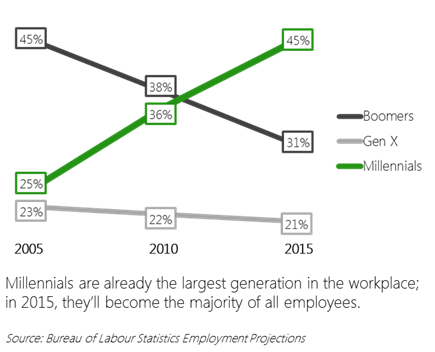 Next Year Millennials Will Become The Majority Of The Workforce. What Does That Mean For Employee Training? The latest research on the demographic makeup of the modern workplace is out, and with it comes a striking headline. The Millennial generation — which passed the Baby Boomer generation to become the largest generational group in the workplace a few years ago — is on track to become the majority of all employees next year. It’s a significant shift in its own right — and one made even more striking by the timing. Because even in 2015, some 40% of Generation Y won’t yet have graduated from school. According to the statistics, Millennials (born between 1980 and 2000) represent the single largest generation group in the history of the world, outsizing even the Baby Boom from 1945 to 1965. In fact, it’s the sheer scale of these two groups — and the timing between them — that is leading this massive shift in the workforce. While the much smaller Generation X has entered its prime working years, its membership only accounts for only a bit more than 20% of the workforce. Boomers, by contrast, accounted for 45% of the workforce just 10 years ago, and even five years ago outnumbered Gen X 2 to 1 as many Boomers held on to jobs rather than retire in midst of the Great Recession. And now as the global economy stabilizes and Boomers begin to see retirement rates increase, those workforce numbers are quickly being filled by the newest age group to make its way into the office — Millennials. Yet as many workplaces have already discovered, the characteristics that made a welcome office for the Boomer generation haven’t been so readily adopted by Generation Y. The expectations of today’s Millennial-aged professionals are now well-documented — young workers expect flexible schedules, on-demand information, and perhaps above all, opportunities to do what they would define as meaningful, valuable work. 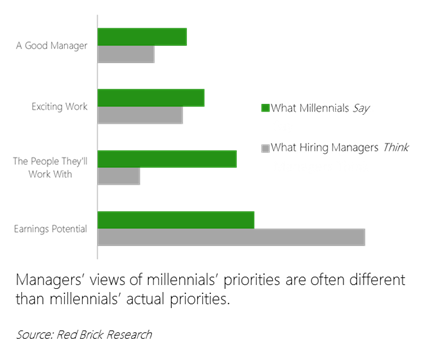 Contrast with their predecessors — or even managers’ perceptions — and the priorities that motivate millennials are quite different from those of their peers in decades past. Fortunately, for corporate HR and Learning & Development teams, those new priorities represent a great new opportunity. As video becomes more and more common in schools and universities, today’s recent graduates are getting more and more used to using video to learn concepts, review lessons, and share ideas. Indeed, for a new generation of students, video has become an essential tool for learning and communicating — on par with email or text. For the corporate HR and Learning & Development teams charged with helping this new wave of employees succeed in their organizations, that preference for video opens a number of new doors for scaling employee training, boosting internal communications, and enhancing the way businesses manage and share knowledge. Phonebook-sized handbooks, day-long in-person training sessions, four-page instructional emails, and hour-long meetings presented with no prior information — Millennials are used to the world of academia, where it’s a safe bet nearly all those information sources would be shared by video and available on-demand. A modern video platform can make any of these types of videos easy for anyone to record and share — and make the resulting videos searchable and viewable anytime, anywhere, on any device. In a world where, according to IDC, knowledge workers spend 8 hours a week just searching for the information they need to do their jobs, access to on-demand information is critical for working productively. As Millennials step out of the world of carefully sequenced academic curricula, they’ve come to expect information right when it’s useful — and structured in simple, digestible chunks to ensure the message can be understood. A single, massive product guide or intensive week-long training session are an anathema to this group — they don’t want everything all at once, just the specifics they need at exactly the moment they need them. That might be why “the face-to-face classroom is no longer the norm,” as writes Forrester Research. To better support today’s learners as Millennials enter the workforce, the firm recommends organizations instead adopt self-paced learning material accessed online, including discussion groups, wikis and resource centers, and of course, video from both the training team and internal subject matter experts. These kinds of resources let Millennials (and all your other employees, too) learn what they need, when they need it, while offering the opportunity to learn more on-demand. Forrester Research has found that Millennials prefer to learn from peers, finding answers not by digging into a guidebook but instead by sending a quick instant message to an expert colleague. That’s good news for businesses because collaboration isn’t just a faster way to get more done — it actually works better, too. Studies show that 70% to 80% of on-the-job learning comes from informal knowledge sharing rather than formal training, and that employee productivity and problem-solving capabilities are improved more by social learning than by innovation. 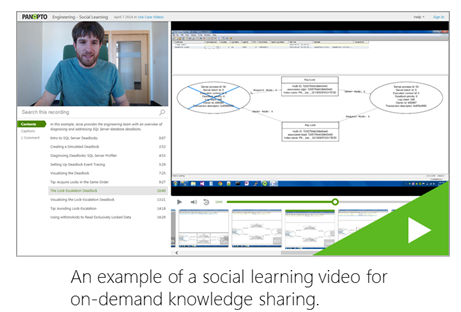 Video is already becoming an essential collaboration tool in most organizations, and more and more organizations are finding that internal video libraries can quickly become filled with answers to questions from subject matter experts, advice from veteran employees, and other valuable institutional knowledge that would previously have gone unrecorded. 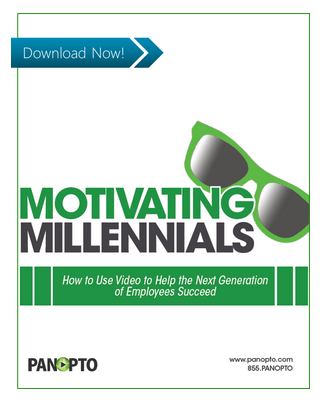 Learn more in our free white paper, Motivating Millennials: How to Use Video to Help the Next Generation of Employees Succeed.